Crash risks while driving at night are higher than during the daytime, but most roadways in the U.S. do not have roadway lighting. In fact, many state and local governments find it difficult to pay for installing, operating and maintaining roadway lighting. Despite these concerns, the proportion of nighttime driving is not likely to go down in today's round-the-clock economy, making car headlights increasingly important to nighttime driving safety. 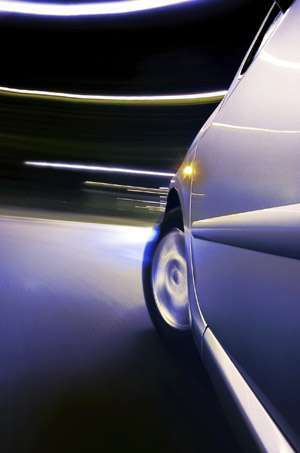 Through its Transportation Lighting and Safety program, the Lighting Research Center (LRC) at Rensselaer Polytechnic Institute is evaluating the potential for new lighting technologies and approaches to improve driving safety at night, including new car headlight systems. Senior Research Scientist and Adjunct Assistant Professor John Bullough presented recent LRC research results at two international conferences dedicated to driving, vision, lighting and safety. At the International Symposium on Automotive Lighting (www.isal-symposium.de), held September 23-25 in Darmstadt, Germany, Bullough presented a paper entitled "Applying visual performance modeling to adaptive curve lighting safety data," looking at swiveling or bending headlights that direct light into roadway curves. Visibility analyses from LRC field studies using these systems in comparison with conventional, stationary low-beam headlights led to estimates of reduced nighttime crash frequencies of almost 4% along low-speed, sharp roadway curves and between 1% and 2% along higher-speed, shallower curves. Earlier, at the Detroit Institute of Ophthalmology's The Eye, The Brain and The Auto research congress (www.dioworldcongresses.com) held in Dearborn, Michigan from September 16-18, Bullough presented "Adaptive vehicle lighting, visual performance and safety," a look at the potential safety benefits of adaptive or glare-free high beam headlight systems, which are beginning to appear on international vehicle models. These systems allow drivers to use high beam headlights while selectively dimming a portion of the beam when oncoming drivers are present, which prevents glare to the oncoming drivers while providing improved visibility along the rest of the road. The LRC's analyses suggest that nighttime crashes might be reduced by nearly 7% when adaptive high beams are used, relative to using low beam headlights. The basis for both studies was the relative visual performance (RVP) model developed by LRC Director Mark Rea. Bullough and Rea previously showed that the safety benefits from roadway intersection lighting were in line with visibility improvements evaluated using the RVP model for different types of intersections. According to Bullough, "Since visual performance for nighttime driving situations can be predicted accurately, and nighttime crash data are difficult to collect, RVP could serve as a practical surrogate for crashes, allowing us to efficiently identify new lighting systems for maximizing driving safety at night." More information: Both studies were sponsored by the Transportation Lighting Alliance (TLA), consisting of vehicle and lighting manufacturers Audi, Automotive Lighting, Hella, OSRAM SYLVANIA, Philips, and Varroc Lighting.